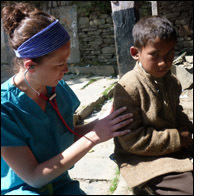 The Himalayan Health Exchange is an organization that for over a decade has brought in Western medical teams and set up camps throughout the year to secluded regions in the Himalayas. I participated in a trip over the Chansal pass in October of 2011 with a group of 16 other medical professionals. We experienced the eight-hour, 60 kilometer drive, and made our first camp in a small town called Shildesh. From there, we traveled deeper into the Himalayas, hiking over the Chansal Pass, and settling in the valley on the other side. Over the course of three weeks, we set up 14 clinics and saw over 2,300 patients. These patients came from the surrounding villages, with one clinic site often serving many villages. The medical personnel and villagers alike often had to hike one to two hours to reach each site. The patient population is generally healthy by virtue of their diet and daily manual labor. The vast majority of the complaints we encountered were for acid reflux, arthritis, and poor visual acuity, but scattered among these basic complaints were patients with more acute issues. I felt the only palpable thrill from an aortic stenosis murmur that I am likely to ever feel in my career in a nine-year-old girl who we sincerely hoped was able to make it to a hospital. I saw cellulitis that was so advanced that it was likely to cause the patient to become septic if not treated promptly and impetigo so rampant that we considered sending the whole town home with antibiotics. This work was both fulfilling and frustrating, because while we clearly were able to help a large number of people, we were not there to provide long-term, continuous care. We also were unable to provide any in-patient management. It made me realize that while some of what we do in modern medicine is probably overkill and superfluous, my patients whom I see in the United States are blessed to have such rapid and easy access to the best services in the world. The experience made me want to develop a permanent relationship abroad in order to provide more continuous care to one population, and at the same time truly made me appreciate the setting in which I work every day.